Here at this illustrious University, researchers have access to some pretty hefty supercomputing capabilities. It was actually the second most powerful academic supercomputer in Europe when it was initially set up. As a matter of fact, there are three disciplines which use more of the cluster’s computing power than anyone else — astronomers, chemists and computer scientists. Normally, I’d put in a joke here about clusters computing clusters (atom clusters, galaxy clusters…), but I’m not in a particularly nerdy mood, so I’ll let you make one up yourself. Realising that I represent two of these three groups, it would be rude of me not to do some CPU-intensive uber-calculations, now wouldn’t it? Well, in all seriousness, it’s mainly the fact that a big part of astrochemistry is spectroscopy, and a big part of theoretical spectroscopy is Density Functional Theory (DFT). 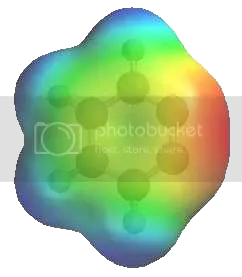 DFT calculations let you map out the electron density of a molecule (as shown in this image of benzyne — redder means higher electron density). It’s a rather nicer method than having to use Schrodinger’s wave equation too. The Hartree-Fock (HF) method uses that, and it only really works for atomic hydrogen. Add any more electrons and it breaks (which is where the Born-Oppenheimer approximation comes in). But I should stop ranting now, because few people find theoretical chemistry that interesting (and most people find it rather scary). Incidentally, one of the most used computations astronomers like to play with are Monte Carlo simulations. Chances are, I’ll have to learn how to use them too at some point… But all in due time. This entry was posted in chemistry, Imported from Livejournal and tagged computing, spectroscopy. Bookmark the permalink.